**If the week you're interested in is unavailable please contact us about our other North Wildwood and Wildwood rentals! ** This unit only rents weekly Saturday-Saturday during June, July and August. Get ready to enjoy another wonderful vacation just steps to the beach/boardwalk (no streets to cross) in our newly renovated North Wildwood townhome on 24thAve. 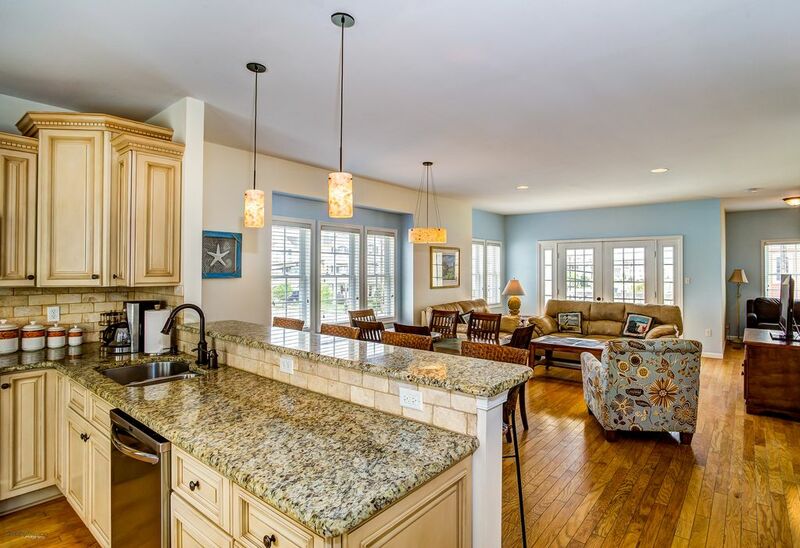 This tastefully decorated beach home offers 3 bedrooms, 2.5 baths on three floors with a heated POOL! The Moreys Surfside Pier offering rides, roller coasters, go carts and the Ocean Oasis Water Park is only a stone's throw away! The ground floor of this townhouse features parking for three cars with a private 1 car secure garage along with storage of all the bikes and beach gear. The main entry door opens to the foyer with stairs heading up to the main floor. The main floor is where all the family fun happens! This large open living area features hardwood floors throughout, a new kitchen with all new appliances, granite counter and bar area with seating for four, and a dining area with seating for 6. The living room has a full sleeper sofa, love seat , accent chair and new flat screen HD television with DVD. French doors open onto a deck with new patio furniture. The main floor also includes a small semi private nook with a large chair that opens into a twin bed. The third floor holds all of the bedrooms. The large master suite has a queen bed and its own private bath with a tub/shower, and a walk in closet. The other two bedrooms have lots of storage space and share a full hallway bathroom. One bedroom has a twin and full bed and the other has a queen bed. The third floor also has a laundry room with a washer and dryer. On the bay side of 24th ave, you will find a park featuring basketball, tennis, a playground and skate park. Just a few blocks way is a supermarket, drugstore, and other retail shops. Enjoy Wildwoods free beachs, (beach tags not required). Wildwoods beachs were voted number 1 for Jersey Shore Beaches in 2010. All Kitchen ware is provide. Linens are not provided so please bring your own sheets and towels! Heated complex only pool with shower and bathroom! -Private Secure garage for all your bikes and beach gear -Outdoor Grill -Pillows and Comforters on beds -All Kitchenware -Heated POOL!!! We loved our stay at this house. Easy walk to the boardwalk and beach. The house was newly renovated and clean. Will definitely recommend to others. I have been going to North Wildwood for over 15 years, and this is the nicest place I have ever stayed at. The kitchen is well stocked for all your needs and the property is stunning. Adrianna is the nicest person to speak with and calls you back immediately for anything you may need. I have found the place I will be renting for the next twenty years. You wont be disappointed with this property. We choose this condo because of its size and location. There is only one word to describe it. BEAUTIFUL!!! The pictures show it the way it is. Beautifully decorated. Well stocked in the kitchen. The bedrooms are well sized and the master is so pretty. There was new furniture on the deck. This unit is so well maintained. The unit was very, very clean. There were 9 of us and we had no problem with space. This is a townhome with the full bathrooms upstairs and a 1/2 bath on the main floor. You have your own private garage which is great for storing beach supplies. You can also park three cars here. This unit has its own private entrance which is a plus. We loved this unit. The location is perfect. Located at 24th and Surf, there are no streets to cross to get to the Boardwalk and beach. It is right down the street from the bike rental too! It is close to Sam's Pizza, Gateway 26 and Morey's Pier. The owners of this unit are very kind and wonderful to work with. They stay on top of everything and answer all emails and phone calls. If you are looking for a beautiful, clean townhome to rent close to the Boardwalk and beach with great owners to work with, this property is for you. Perfect for multiple families or large families. We had a wonderful stay and would recommend this townhome to our friends. Thank you-we're so happy to have contributed to a memorable Wildwood vacation! Beautiful rental in north wildwood. This property in north wildwood was hands down the best place we ever stayed down the shore. Perfect location, beautiful kitchen, living room, bathrooms and bedrooms. Plenty of room for everyone to have their own space. The owner was very sweet and accommodating. Made sure everything was as promised for our vacation. Would definitely recommend this place and are looking toward to renting again next year! Thank you so much! We strive to make our renters feel at home, just with the added beauty of being at the shore! My family and I stayed in this unit for a week and absolutely loved it. We had 5 adults and 2 young children and it was perfect for us. The walk to the beach and boardwalk is short and there are no streets to cross. Because it is an end unit, there are plenty of windows and it's nice to only have neighbors on one side, even though we never heard them all week. The unit was clean and had everything we needed for the week. The owner was also very pleasant to work with. We loved it so much that we already booked a week for 2014! We rented this house for a family vacation and we loved it! The house is so clean and well decorated that you cannot not feel at home there. We only had to walk one block to get to the boardwalk and to the beach so it is perfect for families with young children. The beach is very clean and has shallow water (again, perfect for young children) and all beaches in Wildwood are free. There are many places to ear near and a nice playground where kids can play 5 mins from the house. The kitchen is fully equiped and nothing is missing! We were very pleased with our stay. * the pool is not well kept and I wonder if it is ever cleaned... There are garbage laying on the ground next to it and the restrooms are very disgusting. If you don't intend to use the pool, this house is perfect for you! If you do... well think about it! I recommend this house 100%! :) We had a great vacation! Thank you! $1000 due at lease signing to reserve week, Balance due 1 month before stay This property only rents weekly Saturday to Saturday starting June 9 through Sept 1 Please speak with owner for accurate pricing and conditions.